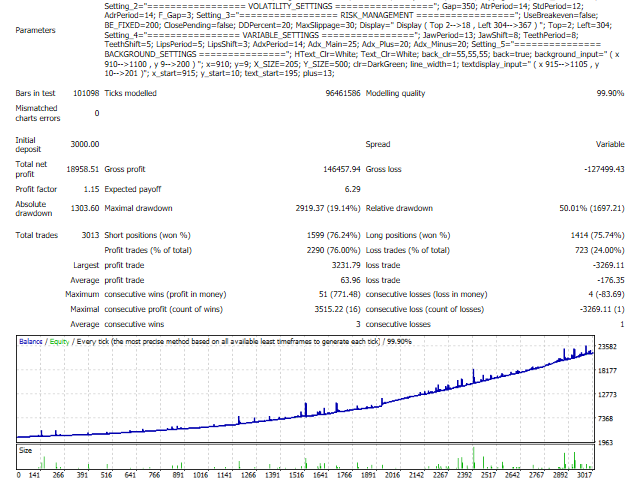 This trading system is based on criteria of various technical indicators. 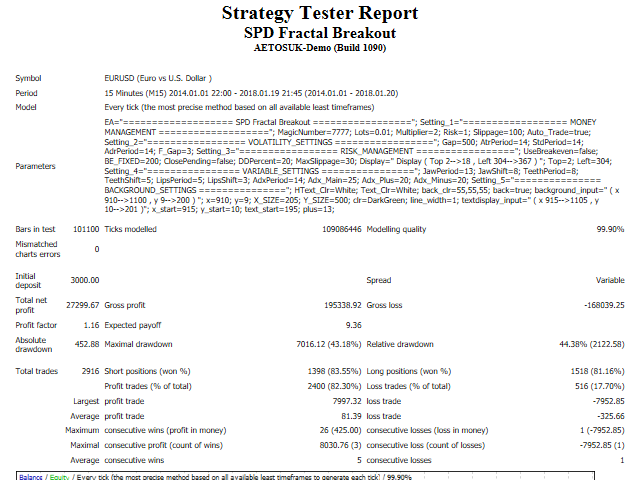 These include fractals, Alligator and ADX (measuring trend strength with average directional movement index). 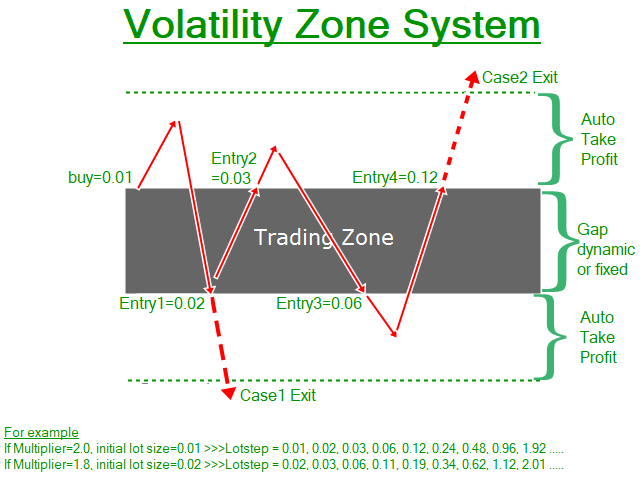 This algorithm uses a hedging strategy in the zone of volatility. To explain it: if fractal to buy is above the Alligator's Teeth line, the pending Sell Stop order to open the position should be placed 1 point below the low bar, which formed a fractal. If the fractal to sell is below the Alligator's Teeth line, the pending Buy Stop order must be placed 1 point above the high bar, which formed a fractal. And by adding the Average true range (ATR), Standard deviation (STD) and Average daily range (ADR), they can be used to calculate the area of loss recovery with two methods, dynamic and fixed. This strategy is similar to the "FDM Strategy". 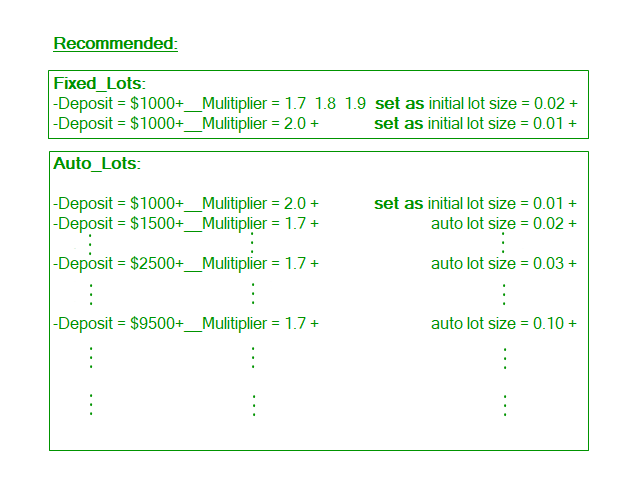 Initial deposit $1000+ (minimum Lots = 0.01). AtrPeriod - ATR averaging period. StdPeriod - STD averaging period. AdrPeriod - ADR averaging period. JawPeriod - Jaw line averaging period. JawShift - Jaw line shift. TeethPeriod - Teeth line averaging period. TeethShift - Teeth line shift. LipsPeriod - Lips line averaging period. LipsShift - Lips line shift. Adx_Main - Base indicator line. 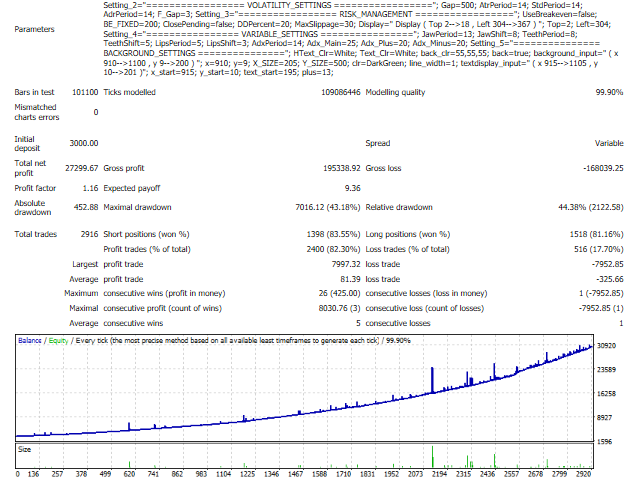 Adx_Plus - +DI indicator line. Adx_Minus - -DI indicator line. - Display Function: Improved the display function.